Pure Diamonds Investments has a rock solid reputation within the diamond investment industry, specialising in the sourcing and supplying of ethical diamonds to be held as an investment. 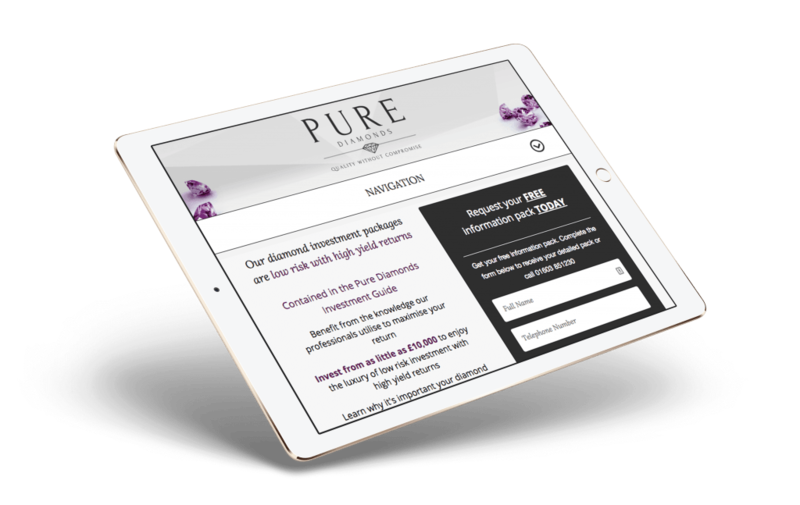 Pure Diamonds Investments approached us with the desire to generate more investment related leads for a rock solid investment opportunity. Their existing operation was almost exclusively offline and they needed a strong brand and web presence to reflect the investment opportunity. In order to resonate with a high-end investment audience, we decided it would be best to completely redesign the brand and corporate stationary to be more in line with the wealthy audience they are trying to appeal to. Once the brand identity was established, this laid the foundation to produce a stunning website visual which was coded into the latest web standard for SEO friendly results. To support the launch of the new site, we developed and executed a multi-channel digital marketing campaign to drive fresh leads of wealthy investors excited by the prospect of diamond ownership. A three colour palette was chosen to improve branding and creative, along with a logo mark which represented luxury, wealth, and dependency. A diamond-like graphic was introduced in the background to reinforce the concept of solidarity and dependence. This idea was carried through to the website and branding stationary. Wireframes were drawn up for the website to map out where potential investors could be converted. It was important to explain the benefits of investing in diamonds as well as keeping the site visually engaging. This was executed using graph layouts, investors first-hand accounts and factual information. The CTA form at the top of each page also had to be persuasive in terms of language and offering. What our team delivered was a responsive website which is easy to administer. The WordPress CMS based website uses the Bootstrap framework to ensure an optimised user experience is delivered, regardless if the search is performed via desktop, mobile, or tablet. Pure Diamonds needed to convert site visitors on all platforms. We developed the website on a responsive grid, that would re-purpose itself depending on the device it was being viewed on. The site had to be just as legible and engaging as it was on desktop giving precedence to key areas. An info-graphic timeline was designed to explain the process from excavation and diamond storage to investment and return. Bespoke icons were designed to represent the various stages of the timeline. Take a look at what Andrew said about Soap Media. Working with Soap has been amazing. The team really took the time to understand our business model, our audience and delivered a stunning brand, website and marketing campaign that exceeded our expectations. The new website has allowed us to cement a solid brand reputation in the diamond investments market.